Starry River of the Sky by Grace Lin. Grades 4-7. Little, Brown Books for Young Readers, October, 2012. 294 pages. Reviewed from ARC provided by publisher. Rendi did not expect to end up here, in the middle of nowhere, a tiny village called the Village of Clear Sky, where people claim to have moved mountains and feuds start with snails and last years. He'll be on his way, thankyouverymuch, just as soon as another guest shows up at the end and Rendi can hitch a ride out of there. Discovered as a stowaway, he takes a job as chore boy until he can sneak a ride with another guest to the inn. But when that takes longer than anticipated, Rendi finds himself swapping stories with the inhabitants of the inn and hoping he can solve the mystery of just where the missing moon has gotten to and why he's the only one who seems to be able to hear the moon's cries. Grace Lin does it again with this companion volume to Where the Mountain Meets the Moon, weaving folklore at its finest with a book that celebrates the very art of storytelling. She is a master here at building tension. From the very first page, the reader experiences the profound sense of wrongness that Rendi is feeling with no moon in the sky. Something is very, very wrong in this village and Lin parcels out clues as her characters open up to each other and start sharing their stories. Story is quite literally a lifesaver in this book. Not only do the characters resolve their problems and learn how to help each other through sharing stories, but Rendi relies on story to save his life from kidnappers. The importance of tales passed down through the generations is evident here, and new stories are celebrated just as much. Ms. Lin creates a cast of characters that will stick with the reader. Rendi is intriguing as a protagonist because we don't know what his modus operandi is right away. The reader gets clues as Rendi begins to share stories with the group. The satisfying ending brings all the stories back into play as we see how everything has fit together all along. This is another hit from Grace Lin. Written in the same style as Where the Mountain Meets the Moon, it's a story that could stand very well on its own. However, if you haven't read Moutain, you should probably go ahead and do that because it's a great book! 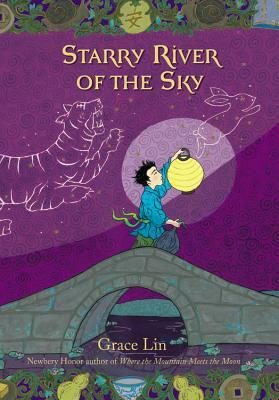 Starry River of the Sky will be on shelves October 2! Fighting for Awesome at #cypd12 !